Editor's note: Tom Murphy, John Mayer and Ron Klodenski contributed to this article. The topic was inspired by Tom Murphy's research into the Back River train trestle and the changes in the Amesbury rail yard layout over the years. If you’ve visited Crave restaurant, set back from Elm Street in downtown Amesbury, you may already know the building started life as a train station. When you look more closely into the history of Amesbury rail service, quickly you discover the station’s 180-year history has some interesting twists and turns. Between ca. 1844 and 1889, railroad engineers moved the station to different locations presumably in efforts to provide convenient service to businesses and passengers. Unfortunately there is no single narrative that reveals the full story. Using maps, photographs and scattered newspaper accounts, we can begin to assemble the chronology of rail service in Amesbury. Around 1844 the first depot was built on Water Street at the end of the Eastern RR line (see 1854 map below). The station was located close to its final placement (today’s Crave restaurant) and the building had a very different footprint. In this location the depot could serve the thriving textile industry and bring passengers into what was then called the Mills Village. 1854 Clark map shows the original passenger station (labeled “DEPOT”) on Water Street at the west end of the tracks. Following the chronology of development in historic maps - by the 1880 the railroad company had built a new station, and the old station has been removed. Perhaps the thriving carriage industry and the development of new buildings along the rail line caused the change. The new station was constructed farther back up the rail line, somewhere along the southeast edge of today’s N. A. Nichols Co. scrap yard. The maps and photo below show its location and architecture. 1884 Walker map shows the new passenger station (depot) located far east of Water Street. 1880 Bigelow map, Amesbury and Salisbury Mills, shows the passenger station facing Back River and surrounded by tracks. 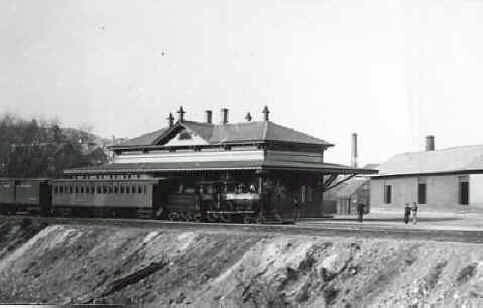 Photograph of train station in the 1880s, when it was close to the banks of Back River. 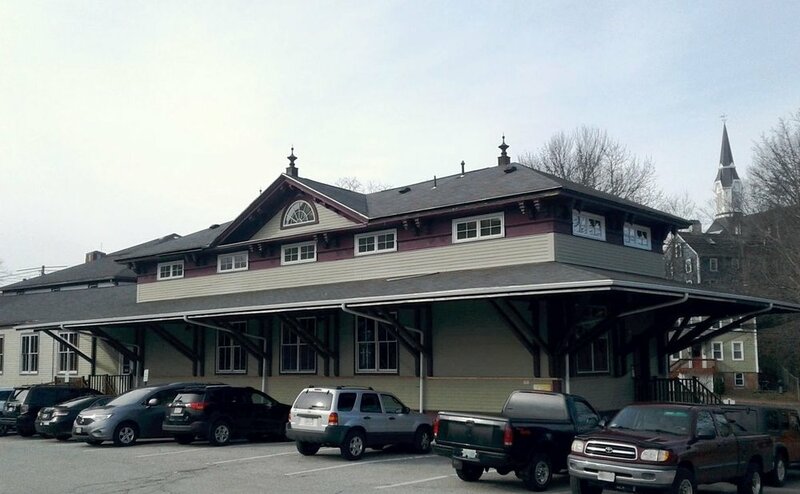 While the new station was close to the heart of Amesbury’s carriage district, the location posed a problem for passengers -- there was no way to get to the station without crossing tracks, and this made accidents more likely. Soon after the station opened there was talk of moving the new depot closer to the center of town, back near the location of the original station. At last our railroad station has been moved. It was done quickly, being placed on six platform cars, three on each track, and pushed up to its new site by a locomotive. The novel sight attracted many spectators. It must have been quite a sight! Changes to the station didn’t end in 1887 when it moved to its current location. According to a 1981 report by the Massachusetts Historical Commission, the station was converted to a farmers feed and supply store after railroad passenger service to Amesbury ceased in 1936. Then in the 1960s, it was connected to an adjacent auto parts store. Since that time, it was been restored to its train station look and now houses Crave restaurant. 1889 insurance map shows the passenger station after its 1887 move to its current location, set back from Elm Street and visible from Water Street. The tracks ended at the edge of Water Street near the entrance to today's elevated parking lot. Amesbury passenger station, viewed from Water Street, after moving to its current location. Barriers on right show how tracks ended at the edge of Water Street as indicated by the 1889 insurance map on the left. Hand-colored postcard from “Railroad Stations in New Hampshire and in Massachusetts” (lightlink.com/sglap3). Amesbury passenger station viewed from Water Street around 1900. Hand-colored postcard from “Railroad Stations in New Hampshire and in Massachusetts” (lightlink.com/sglap3). Passenger station as it looks today, home of Crave restaurant. Ten Years Later -- What’s in the 1885 City Directory?